I had heard of these flowers for a long time, but this story is how I found that it was a must-grow-in-my-own-garden plant. I am also an artist (clay is my medium), and was part of a group of artists all with the name Susan. At the opening of our first group show, one of the Susan’s brought a bouquet of Rudbekia for display. That was the moment I decided that I had-to-grow-them-in-my-own-garden. These plants multiply so freely, I can’t believe I couldn’t find anyone who wanted to part with some, so I purchased my first plant. Now I dig up wayward starts and beg friends to take some. They are very sturdy growers, and so are the starts I keep in small pots. But do watch out for the deer, as they find these flowers tasty. 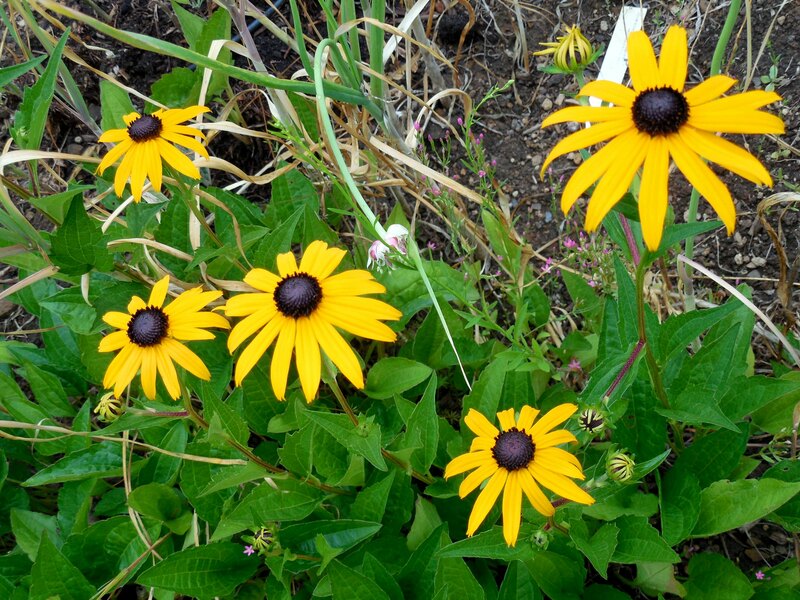 The coreopsis that are blooming now, are the same colors as these black-eye Susans, but are smaller flowers. I think they look nice next to each other. In the lower right of the photo are some flower buds before they open. The black “eye” is peeking through baby-size yellow-orange petals. Categories: Uncategorized | Tags: black-eye, daisy, flower, garden, multiply, perennial, plant, Rudbekia, Susan | Permalink. These cute little flowers almost took over my garden one year. Then I started pulling them up by their roots and cutting them back severely. They are now under control and pop up in the most interesting places. I let them live most of the time, now days. It is amazing how a specific plant can take over in almost the blink of an eye. I think it looks good where it is, and it reseeds freely – such a nice attribute in an almost empty flower bed. From now on, I am on the lookout for a plant that seems too good to be true. Which reminds me of a great old saying: ‘if something seems too good to be true, it probably is too good to be true’. Do not think I am totally disparaging this annual flower, I like many of its positive attributes. Though I have learned from experience to not look the other way at a plant that seems to have it all. As a mid-summer flower, the color blends in well with other blossoms here, and complements the greenery of spent flowering plants. 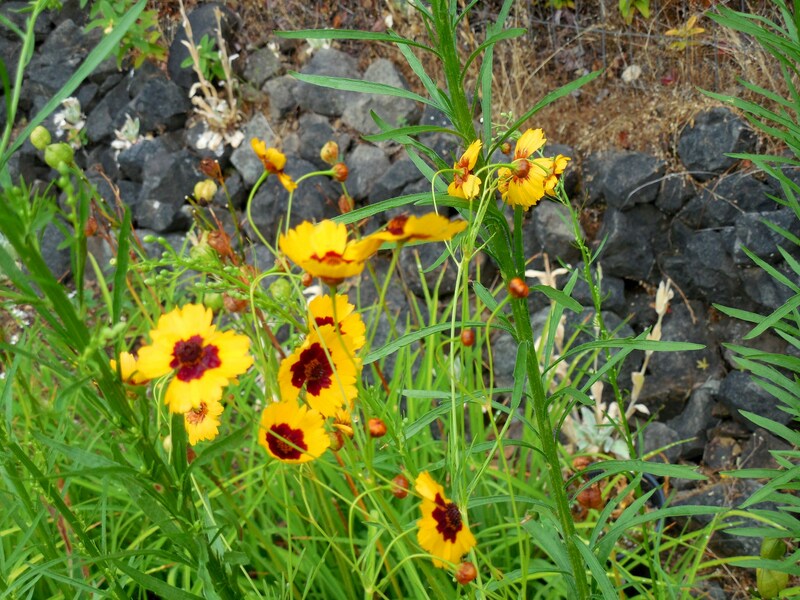 Categories: Uncategorized | Tags: annual, coreopsis, daisy, reseeds, saying | Permalink. Maybe because this is a newer plant for me, and these are the only flowers, but I have not seen any bees around it. I do like the feathery petals of these flowers a lot, and the bright red sure stands out in my flower garden. It is planted between white-flowering salvia and chamomile. 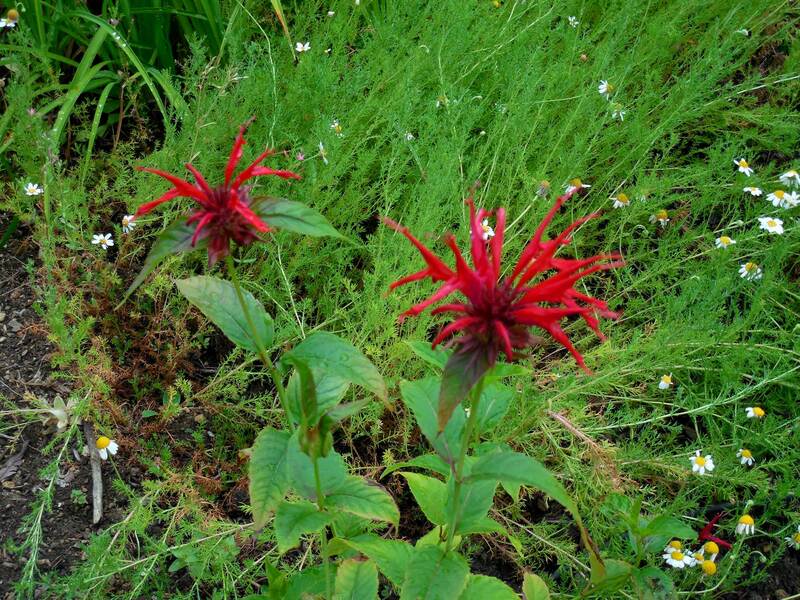 Unfortunately they do not flower in the same month as their blooms would look so striking next to each other with short white flowers under the taller red bee balm. I understand the base of this plant should spread as it stays in one place, and I look forward to seeing that. It will take a bit of nurturing since this flower bed is on shale and clay with redwood trees growing behind. If you didn’t already know, the roots of redwood trees go sideways for a very long ways, and not much grows in their shadow. I just keep adding amendments to lighten the ‘soil’ and keep raising the bed for the flowers. Don’t know how long I can pull this off, but for now, it works. Categories: Uncategorized | Tags: bee balm, blooms, chamomile, clay, feathery, flowers, red, redwood, roots, Salvia, shale, taller, trees, white | Permalink. 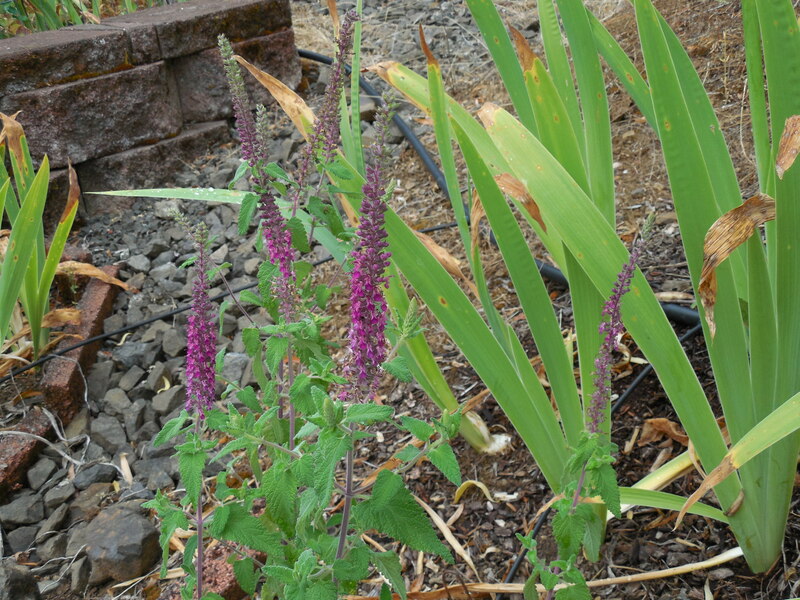 I know that Agastache is a cousin to Hyssop, but cannot tell you how they are alike. (yet!) I have two of these growing in separate areas, and have killed at least that many others. Supposedly the deer do not like these plants, but my experience tells me otherwise. They may not be as delectable as roses or tulips, but they are not on the hated food list either. The agastache I am growing now, are definitely babied. They both have a small fence around them to keep marauding varmits at bay. My long-term goal is to get them large enough to be able to survive on their own. At which point only one fence will be removed a year – I will take few chances on these supposedly sturdy perennials. I like the looks of these flowers a lot, and look forward to including them in cut bouquets as the plants grow and flower more. In the meantime, they are beautifully, distinctive plants in the landscape. 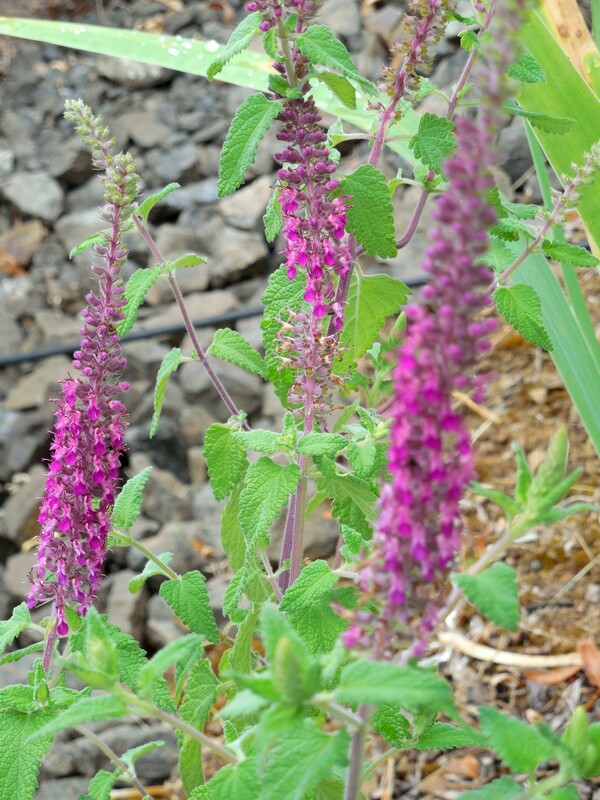 Categories: Uncategorized | Tags: agastache, deer, fence, flower, hyssop, perennial, purple, resistant, varmits | Permalink. While both of these oregano plants look similar in the photos they have big differences. The first photo is Greek oregano, which is low growing like a groundcover. 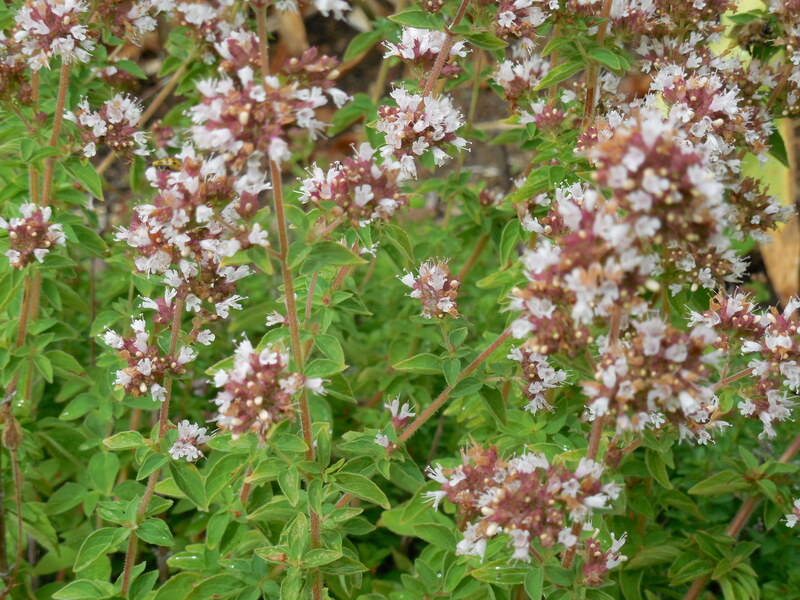 When Mexican oregano comes into bloom, the flower stems shoot up over a foot high. While various bees like lavender and germander flowers, moths are especially attracted to the Mexican oregano. I remember catching these moths when I was a kid (it is not hard to pinch the wings together when they are fully open). In the culinary field, low-growing Greek oregano seems to me to have a stronger aroma and potency. I recently acquired a small Italian oregano plant, that has yet to flower. Have not yet done a taste comparison with the three varieties of oregano either. I like using all of the oregano plants in the landscape, as they have some strong assets, besides their good looks. They are deer and drought resistant. The flowers are a pretty addition to a summer bouquet, but not over-powering in their scent. While the Greek oregano flowers are good for very small vases, the Mexican variety is a nice accent for mid-size flower arrangements. 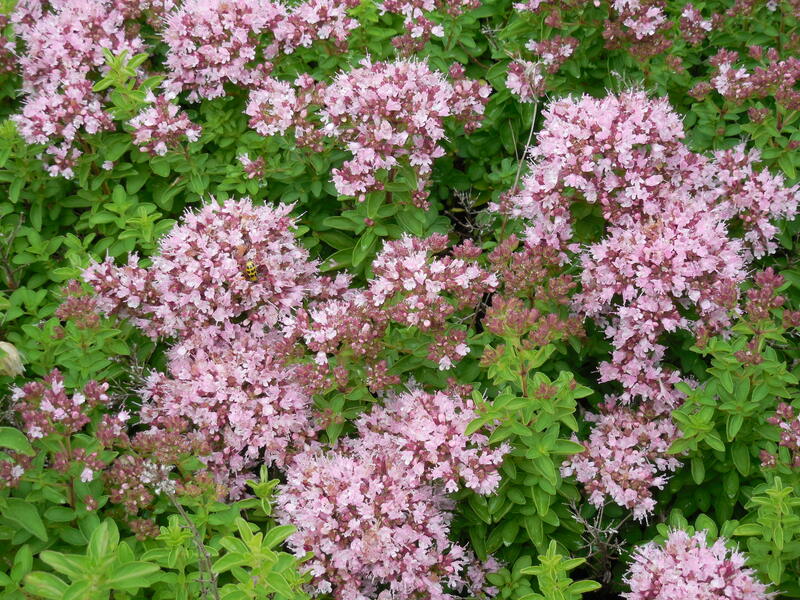 Categories: Uncategorized | Tags: aroma, arrangements, bouquet, catch, culinary, deer, drought, flower, Greek, ground cover, Italian, landscape, low-growing, Mexican, moths, oregano, potent, resistant, taste | Permalink. 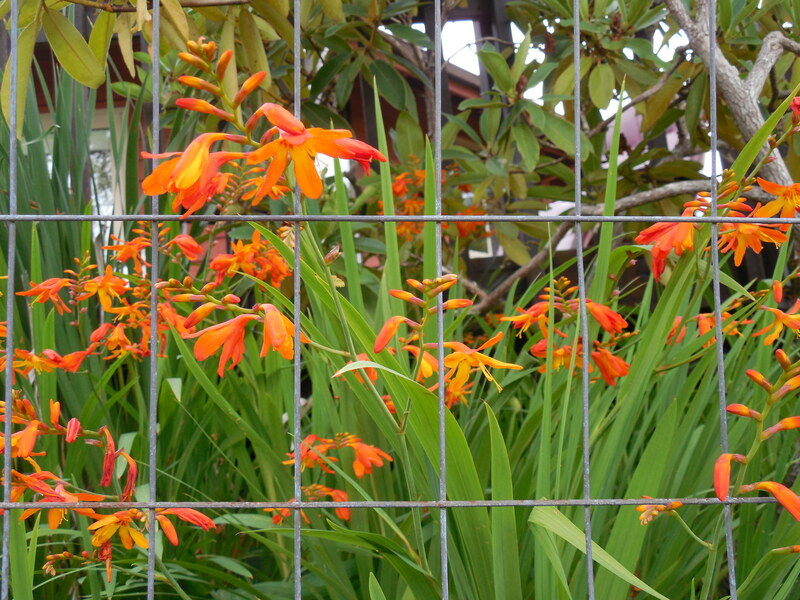 My first set of bulbs for these crocosmia were given to me by one of the people who built my house over 30 years ago. They were growing in his mother’s yard, she had passed away, and the house had just been sold. For me, I have found that flower and plant starts, not from a nursery, can come with an interesting story. When I see the plant in my yard, it brings back memories of where it came from and more. These are sturdy little bulbs, that can really multiply if left undisturbed for a few years. When I think I have dug them out from a flower bed, I see escaped bulblets growing for years to come. Normally my crocosmia thrive when they are protected from deer, but I have them growing in all sorts of places. 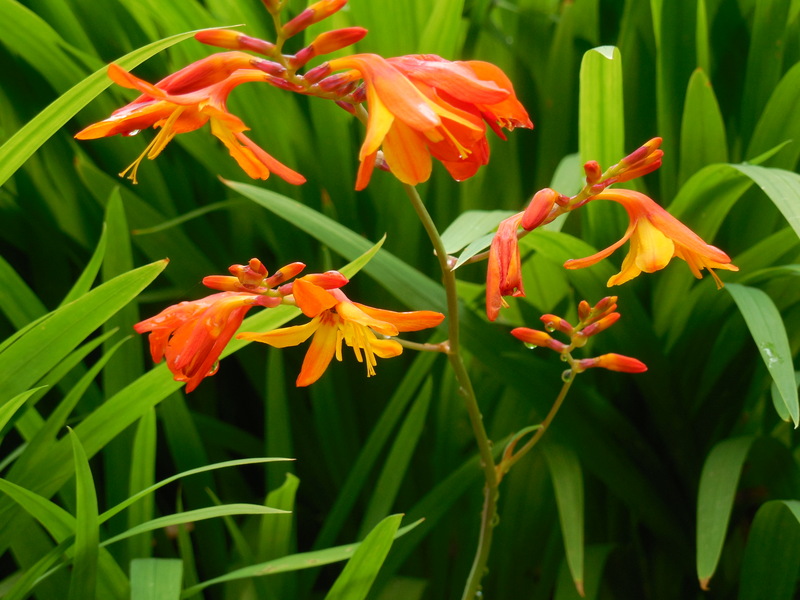 There is one unfenced bed containing crocosmia growing wild with lemon balm, on a hill away from the regular deer paths. Bearded iris and artemisia are also on guard – 3 out of 4 plants that our deer don’t eat, seems to save the crocosmia. Categories: Uncategorized | Tags: bearded, bed, bulb, bulbets, crocosmia, deer, flower, growing, hill, house, iris, lemon balm, mother's, multiply | Permalink. This small plant has but one flower, and it looks magnificent. For a plant that probably was not intended to be planted, much less survive for any length of time, that is a feat. A few years ago, when my Aunt Ann passed away, someone gave a couple of hydrangea plants as decorations at her wake. They are not native to, nor can I remotely believe they would live outdoors in a hot desert climate where her home was. Therefore, I brought one home with me on the airplane (does this fact make her death prior to 9/11?). I planted it, and it took a few years for any new growth to appear. Now it flowers, and I get to be reminded of good times with my Aunt Ann. 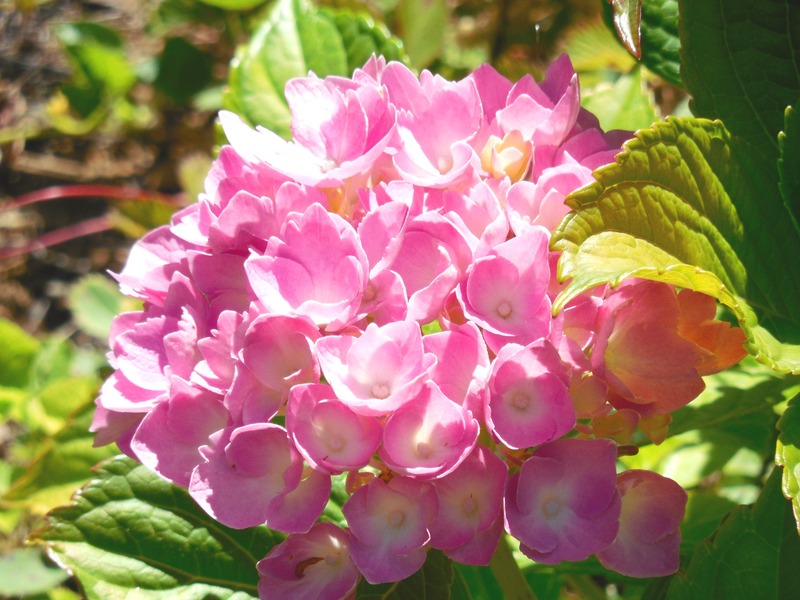 There is much I can say regarding things I’ve learned about growing hydrangeas. And so much more I can say about Aunt Ann, where I spent many summers playing with my cousins, and tidbits I learned from my Aunt. My mind is remembering so many good times, this is all for today. Categories: Uncategorized | Tags: 9/11, airplane, Ann, Aunt, climate, cousins, desert, flower, hydrangea, plant, summer, wake | Permalink.